Leadership has been considered to be a very complex concept. It is very delicate in nature where the person needs to look at a number of things. They need to engage with different people and then produce results. For producing the necessary results, they need to push their people or team members to deliver those results. And they also need to make sure that they are comfortable while doing that. The most important thing will be to make sure that all the demands of the people above and below are being completely satisfied. There are many books and articles which may be available on the concept of leaderships based on certain current leaders or historical ones. But finding the right career for the person who has the potential and the leadership quality inborn is difficult. So for certain careers for born leaders, they need to know the right tricks which makes a leader successful. What kind of an individual can run for president? For a person who wants to run for president, they have to be a very special and unique individual. The person must be smart and skillful and should have a direct and tough character. And they need to be self driven and self motivated to the highest level attainable. Then when they have reached such heights they should know that leading a country is a very high-pressure job. There are millions of people who have certain problems coming and asking for a solution. We look at the Ex-President of the United States of America, Barack Obama. Initially when he was senator he had black hair on his head and since becoming President, his hair has turned white. He knew that after becoming President, the amount of responsibilities that was going to come on him will be huge. So know that, this job is not a joke in any way. Though the individual would have their charm and would want to win the world over but that won’t even be bothered at this point. They should have the ability to convince the other people to vote for them. Having a leading mentality for leading their team in the right direction. Making the right decisions at the highest level of the office. The individual has to be independent for most part of their life. They need to have the ability of making tough decisions aside from allowing any other advisors present to do so. They need to be a courageous individual especially at the time they are representing their country and its people at an international level. They need to be passionate about their role of a President. They need to have a compassionate nature towards themselves and others. They need to be wise in every step of their tenure as President. They need to respect people who may be above or beneath them. Being humble everyday and having a strong commitment are most essential in their everyday life. And they need to be a very proactive person. The person wanting to run for President should first have served at an elective position for a minimum of at least one full term at a junior level. There is no specific qualification that a person in academic should have. They need to have good knowledge about law as well as understanding politics both before and after they get into the office. An army general is considered as the second most powerful person in a country. They have the responsibility whether or not to make certain decisions which will affect the security of the people in a direct way. This kind of a job demands for a person who is courageous and a wise leader. And having these qualities, they can command their respect within the army and even externally. They also need to have the following qualities within them. The person must be a very patriotic individual. With patriotism they will show how dedicated they are to their country. They should never be the person who unites with the enemy and help them. While making their decisions, they need to have an ability of separating the personal and national interests. They need to have the ability of giving the right orders at the right time including such an order of shoot to kill. They need to even listen to others. Obeying the President whether or not they have enough military experience should be strictly followed by them. And most importantly they need to always ensure that their people are kept safe every time. The nature of an army general is never about smiling. They need to be strict and disciplined. Having such a stern face also lets the other people know that their security is taken very seriously. Remember, there is no shortcut towards the service of a person wanting to be an army general in the highest office. They must first start as a rookie. Then slowly as time goes by, they need to earn their place in the army which will help them in rising ahead in their ranks. This can be done by showing the leadership abilities they possess. This rising is very tough but the process will test the individual’s mental abilities, their physical and psychological strengths. They need to show and prove their loyalty to their country and their president they serve. This will only help them in earning a badge of a general. People who possess leadership qualities inborn within them will always look for improving their performances both at the personal and professional level. So in their professional life, with respect to their employees, they would want them to deliver their best. On doing this the employees will be highly productive to the company. Such is a role of the director of a company. The description of a company director has been given below. They are directors who also work with their employees and the people. They make sure that every individual is working to achieve the goals of the business. They give orders to the employee but that isn’t the only thing as giving orders for them is a broader concept. They look forward motivating their employees so that they can reach the goals of the business. They look towards the welfare of their employees. They also have to keep their stakeholders happy and satisfied. And then they need to make sure that the company is making the appropriate profits and then deliver that value to their employees. The person should be a very creative individual in their professional life. They need to have strong skills of interacting with the people. They need to be disciplined enough which will help them in driving forward to achieve more in their life. And every move needs to be calculated well enough if the person wants to win in their life. A company director has to have a bachelor’s degree in either finance, management, business, economics or any other related field. This would be for an entry level job. But at first, the employers would prefer to have an individual having a graduate degree in business management. The person should be all rounder in their career without losing their mind and going crazy as such a job is extremely rewarding. Often in films or TV series, we have seen portrayals of detectives such as James Bond and it fascinates us. But know that such a job is more than having charm in their appearances. Such a job needs inborn qualities which are possessed by very few people. Such is a life of a detective or an investigator who have to face danger in their everyday life at the highest level. They deal with a lot of high level criminals in their everyday life. Such an individual needs to have a strong instinct as they rely on such a quality everyday in their life. They need to be courageous everyday in their life. They need to even possess the skill of sound judgement so that any challenges, dangers or puzzles can be overcome. Having the right training will help them in sharpening any detective skills they will have to the highest. With skills such as empathy and listening, it helps them in taking charge as well as giving directions to the others. The entry requirements for all the law officers will vary. Some will need a high school graduate degree. This will help them with opportunities to advance in their force. But if a person wants a high level job, then having a college degree along with a master’s degree will help them landing in a proper relevant field. Such a category includes having the Pope, also the Al Qaida and drug cartels all in the same category. But know that the intentions will be very different from the other. These organizations will have a lot of leaders within. Such organizations are strongly present in the world. They have an influence on the other individuals in making their decisions at an economic and a political level also. They have a cult like following and are owners of a number of properties all over the world. They make decisions all over the world which influences millions of other people who have different cultural backgrounds in the world. So such an individual needs to have a unique leadership talent within them. Their presence will make the other people listen to them and will also share their different ideas. There isn’t any specific career path to be followed by an individual. The first thing that the individual needs to do is to be a member of the organization. Then they can start their learning process of the organization they are in. Slowly, they have to show and demonstrate how they can influence the other people as well as manage them. And finally show and prove the loyalty to the organization. A person may have a certain likening or passion to the field of accounting. So later on as they progress in their career, being an account executive will suit them a lot. It will help them in demonstrating their leadership skills. Being an account executive, the person will form a team of trusted individuals and be their leader. The employees will be given certain tasks and deadlines by the account executive. And then they will be led to meet the objectives in the right direction, thus showing the leadership skills that the account executive possess. A manager is a person who is in charge of the employees in the company or the organization. The manager sees to it that everything is happening in the right manner under them while they monitor the employees. Then they report back to their superiors. So while monitoring their employees, they need to possess the appropriate leadership skills within them and then only they can use it in the right manner. So a person who is a born leader already has the interpersonal and intrapersonal skills within them. Knowing and understanding that they possess such skills will help them in using it in a much better way. Hence they can deliver their results. And when they work, they will even motivate others to work. 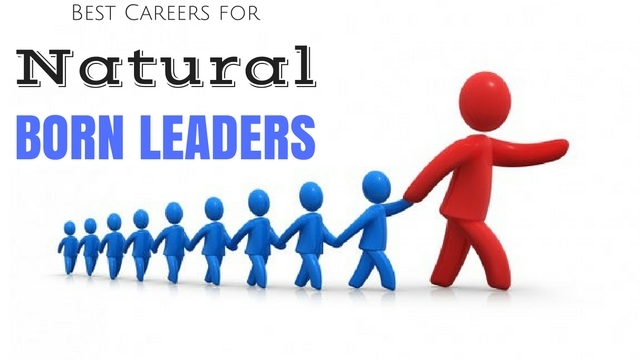 So if a person has the natural abilities to lead, then they can consider some of the possible careers above. Or if they think that they are passionate about something else, then they should try and utilize such a gift in a better way for their future.